Will Grigg was in his pyjamas and ready for bed when Sunderland's sixth bid to sign him from Wigan was accepted. The Northern Ireland international sealed a Deadline Day move at the 11th hour, after Wigan agreed a deal in the region of £4m for his departure. 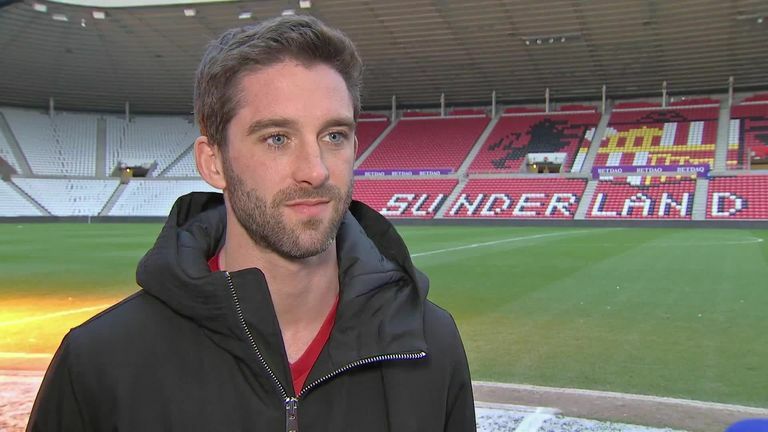 Things then progressed rapidly for Grigg, who agreed to the switch on paper but had to head to the north east on Friday in order to complete a medical. "The deal was off so I got the kids to bed and had dinner, got in my pyjamas and before you know it I've got a text saying can you get to Wigan as soon as possible and it all happened quickly from there," Grigg told Sky Sports in his first interview since becoming a Sunderland player. "As glamorous as it sounds I was in my pyjamas and as soon as I got a text and the call I was in my car straight away just after half nine, so it was quite a late one to be honest. "It's no secret that as soon as the interest came in it was something that I wanted to pursue, with a club like this and everything involved with it - the stadium and the training ground - plus the vision it has as a club, it's something I really look forward to being involved in." The £4m figure will set a new record for a transfer of a player to League One, surpassing John Brayford's £2m move to Sheffield United in 2015. Grigg is under no false illusion that his new club are now depending on him to score to goals to see them promoted back to the Championship. "They've not been shy and proved that they want me, and as a player that's something that you love," Grigg added. "It's an honour to be here and everything they've done to try and get me here is brilliant so it's up to me now to repay them."